365 Days of Kale: Where have I been? Where kale is more than decoration on my plate! Two weeks without a new post begs the question. I am sorry to say that I need to take an open-ended hiatus from my blogs. My mother had a stroke on April 3rd, thus there has been no time to think about blogging. She is currently in a rehabilitation facility, but there are still many unknowns and many decisions to make. I have LOVED blogging. I didn't know what to expect when I first started, but I have found that sharing my thoughts (both personal and professional) plus photos has actually brought me much happiness. So it is only because my time is needed elsewhere for the foreseeable future that I am putting all of my blogs "on hold". First off, I'm sorry to hear that your Mother suffered a stroke. I just discovered your wonderful blog today and I just wanted to say thanks a lot for it. It's too bad that you can't continue blogging, but it's totally understandable. Thanks again. I hope you can come back to your blogs. I was searching for Kale recipes because I have a bunch growing in my garden. I found your blog which I think will be a good recipe resource for me. We all have things that take our time away now and then. I'll keep an eye out, and maybe you'll post a new recipe for us every once in a while. 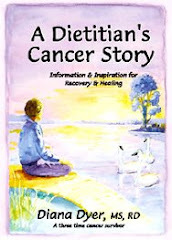 I'm a wife, mom, long-time organic gardener, new organic garlic farmer, Registered Dietitian, author of the book A Dietitian's Cancer Story, website CancerRD.com, and in between all that and more, I am a multiple time cancer survivor. My website focuses on nutrition information for cancer survivors. I began my "dianadyer" blog in June 2007 to share a wider scope of my thoughts about cancer survivorship, food, nutrition, gardening, recipes, our environment, and life. I started this blog "365DaysofKale" in January 2009 in which I write about my passion for growing and eating kale. I hope that I can offer both information and inspiration to eat some kale or one of its healthy relatives every day of the year! Personally autographed copies available at Nicola's Books in Ann Arbor, MI (call 734-662-0600 or visit nicolasbooks.com). Proceeds donated to research funded by The American Institute for Cancer Research (aicr.org, 1-800-843-8114). Subscribe To 365 Days of Kale! • What have I overlooked? Mustard Greens - oh yeah, they have a bite!